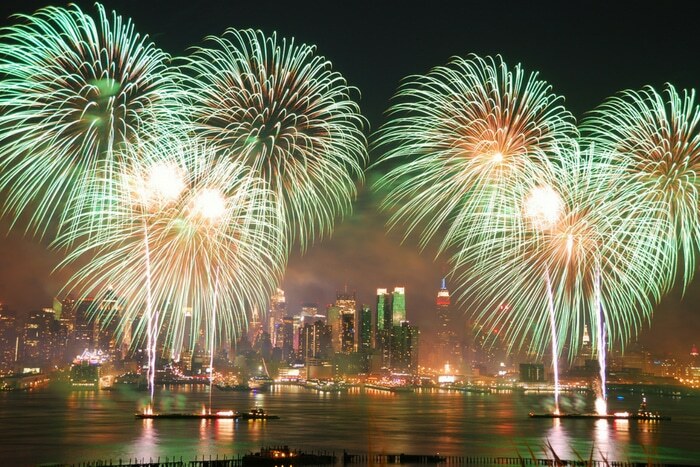 Fourth of July Fireworks always delight especially in these Best U.S. Cities to view them! 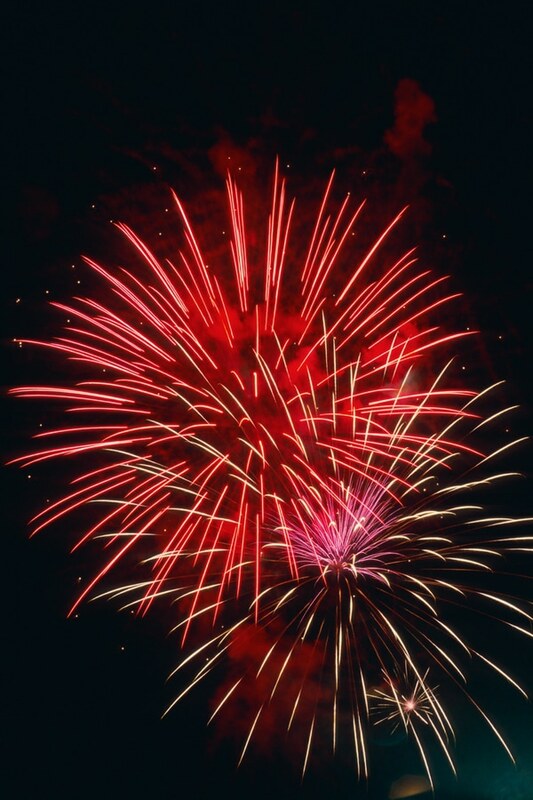 Get the details, helpful insider tips and how to find Fourth of July Fireworks near you! 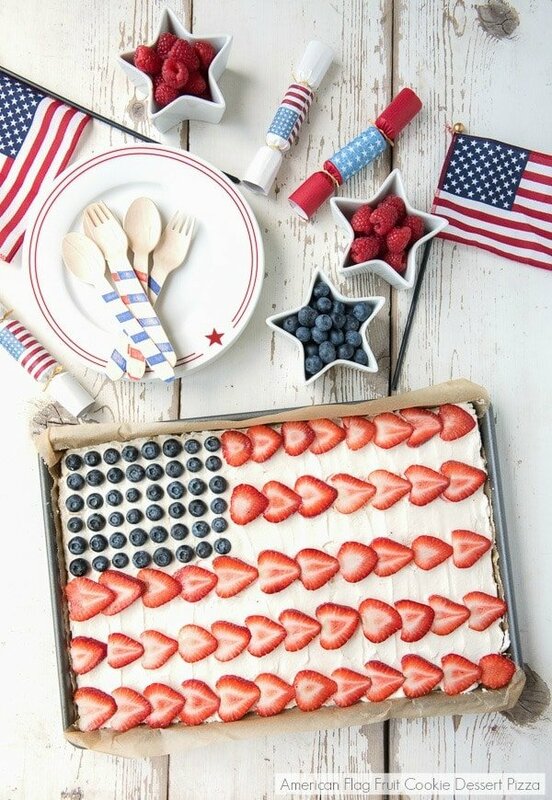 Each July, we celebrate our nation’s history and freedom with backyard barbecues, family get-togethers, and festive parades. Another hallmark of Independence Day? Fourth of July fireworks displays! When it comes to local fireworks, some cities really go all-out and treat their residents to an extra impressive display. If you’re on the hunt for the greatist Fourth of July fireworks shows in the country, I’ve got you covered! 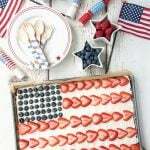 Here are a handful of my favorite spots to enjoy the best fireworks as we celebrate Independence Day! With Fourth of July literally just right around the corner, the time is now to start planning out your course of action to be able to see the best fireworks available. 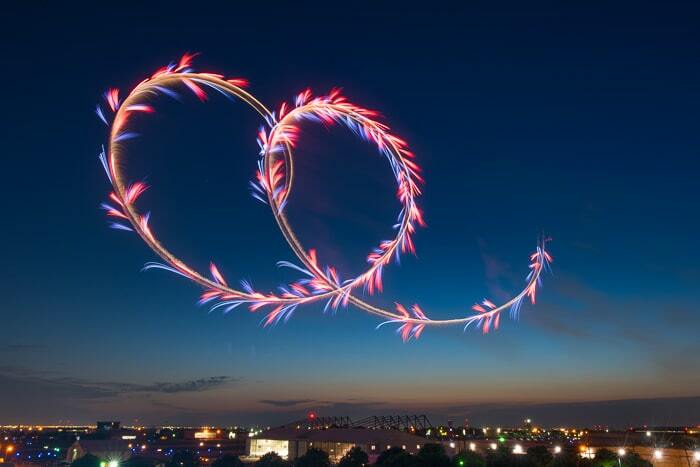 Whether watching local fireworks or taking a long weekend trip (use these ‘cheapest airplane flights’ tips) to larger city, there are great fireworks shows all across the US. A little bit of planning goes a long way to make watching Fourth of July fireworks fun. 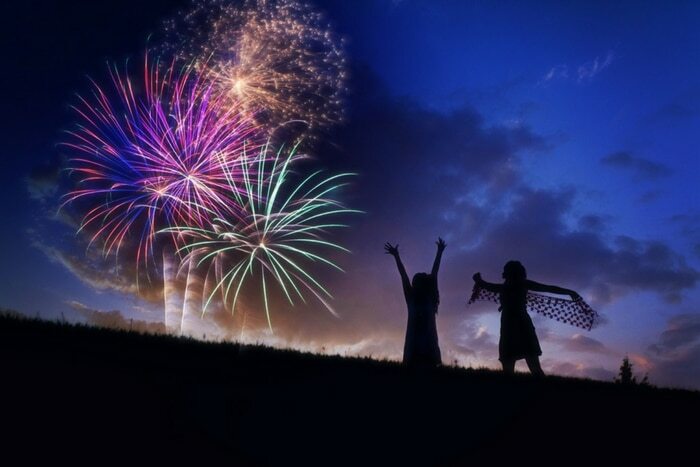 Most fireworks shows start when it’s completely dark, which can mean hours of sitting, variable weather conditions and especially with smaller children, the need for food. Outdoor Water-Resistant Picnic Blanket. As much as I love a camp chair, they are bulky and can get heavy to carry very far (especially in a crowd). This picnic blanket is compact, light to carry and perfect to spread out for all to use. It’s also water resistant! Spreading this out on the grass is the perfect way to stake your spot and relax for the fireworks show! Insect Repellant. When the sun goes down, the bugs come out. Since you may be waiting a few hours for those Fourth of July fireworks, bug spray can make the difference of enjoying the evening and it being miserable. Pack an insect repellant of your choice and be prepared before they start to bite. Glow Sticks. While the dark may be necessary to see all the amazing colors of the fireworks, the little ones in your group may feel that they need just a little light while they are patiently waiting. With the addition of glowsticks to your packed bag, not only will they shine a bit of light, but they’ll provide some much-needed fun time as well! Earplugs. No one wants to miss the beauty of the fireworks, but there are some people that actually don’t love all the noise and booming that accompany the fireworks explosions. No need to hold hands over ears; bring disposable earplugs for those who may want them. It’s a simple fix to help those more noise-sensitive be able to relax and enjoy the fireworks show. Snack food. Having a pre-fireworks show picnic is always a fun way to mark the occasion. 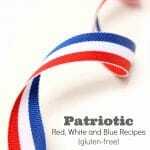 There are plenty of Fourth of July recipes on Boulder Locavore that could be toted along. Or make it easy and pack along an exciting assortment of snacks. The ‘treasure chest’ of snacks in the Snack Food link will make the experience all the more enjoyable for all! Bottled Water. Staying hydrates is critical in mid-summer temperatures. Often larger venues do not have water fountains. Bring plenty of bottled water! Many venues do not allow glass bottles or bottles that are NOT sealed! I love this line of food and drink tote bags that are folded to be compact and pre-frozen in the freezer. The lining has cooling material so you don’t need ice packs and they stay cool for hours in my personal experience. It’s perfect to keep bottled water cold and snacks too. PRO TIP: Consider brining some large plastic garbage bags. They are great to gather any trash before you leave the venue and also in the event of a suprise rain storm, they can be quickly converted to makeshift rain ponchos by making a head opening on the bottom seam and arm holes on the sides! Now that you have a solid game plan of items to pack to enhance your viewing experience, here are some of the best places in the U.S. to watch the Fourth of July Fireworks! NOTE: Each location name is linked to an informational page on those fireworks so you can get more specific details! New York City. It’s no surprise that the largest city in the country is home to one of our largest and most impressive fireworks shows. Launched from barges over the river, New York City’s display often incorporates some of the most cutting-edge technology, and the whole show is coordinated to a booming soundtrack. Snag your viewing spot early – the best free spots to catch the show are in high demand. TIP: Police will NOT be allowing visitors to bring in big bags or lawn chairs and be prepared to be standing or sitting on the ground for the entire time. Viewing locations that offer good views fall between the locations of 24th and 41st streets. For an optimal view, you can always purchase tickets to a rooftop viewing party or another well-situated location. Boston, Massachusetts. Rich in American history, Boston is the perfect place to celebrate Independence Day, and they put on a fireworks display like no other. 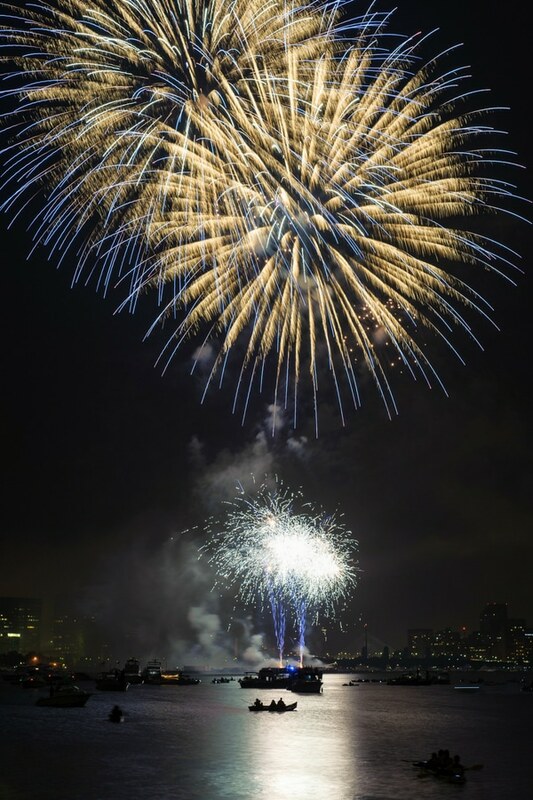 The fireworks show is coordinated in partnership with the Boston Pops Orchestra, which performs at the Hatch Shell during the evening’s festivities and throughout the fireworks display. The performance concludes with a grand finale that involves actual cannon fire and church bells from across the city, making it a one-of-a-kind experience. TIP: this fireworks show has its own App supplying all the details, directions and to share your experience on social media directly or play a trivia game while you wait! Washington, D.C. 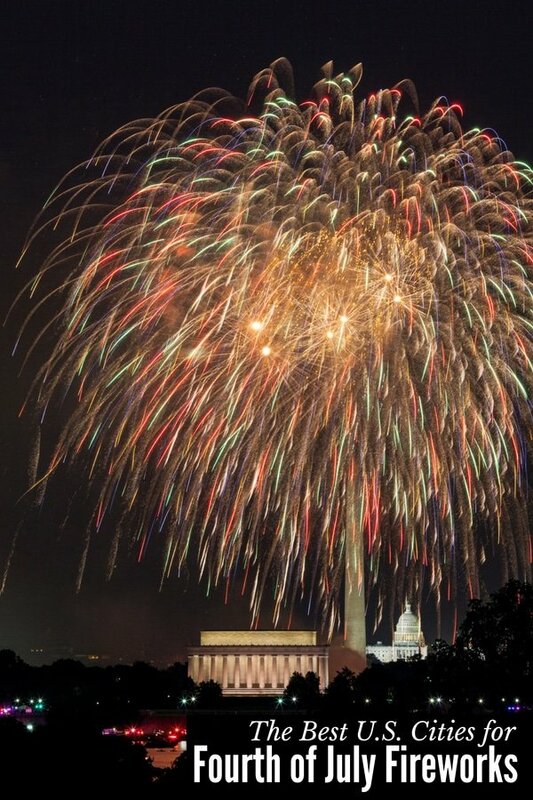 The Fourth of July can be a particularly busy time to visit our nation’s capital, but there are few more exciting places to celebrate Independence Day than in Washington, surrounded by some of our country’s most well-known monuments. Watch fireworks burst over the Washington Monument, casting reflections into the reflecting pool below. Bring a picnic and steal your spot on the grass early for the best view! 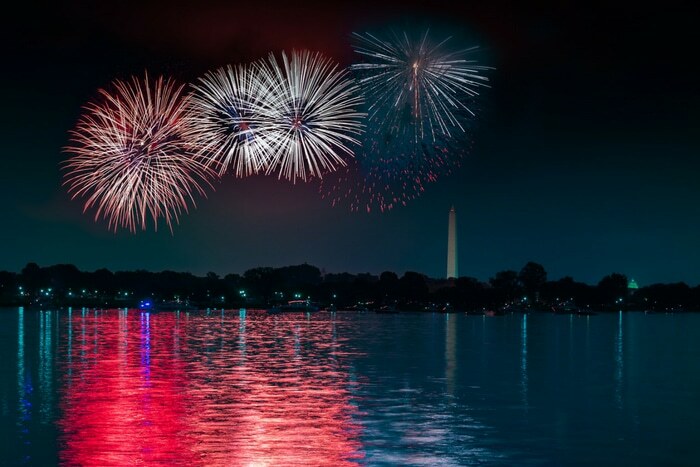 TIP: there are many fantastic places (list), on and off the water, to enjoy the fireworks show if you don’t want to fight the crowds on the National Mall. Chicago, Illinois. 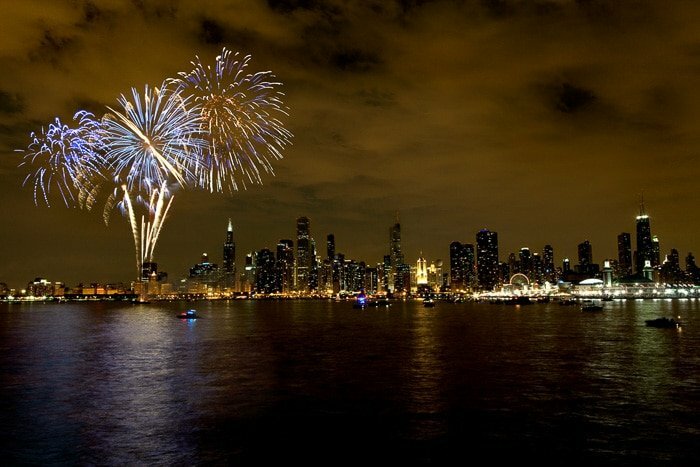 If you find yourself in the Chicago area during the Fourth of July holiday, plan on watching one of the most impressive Fourth of July fireworks shows on Navy Pier. 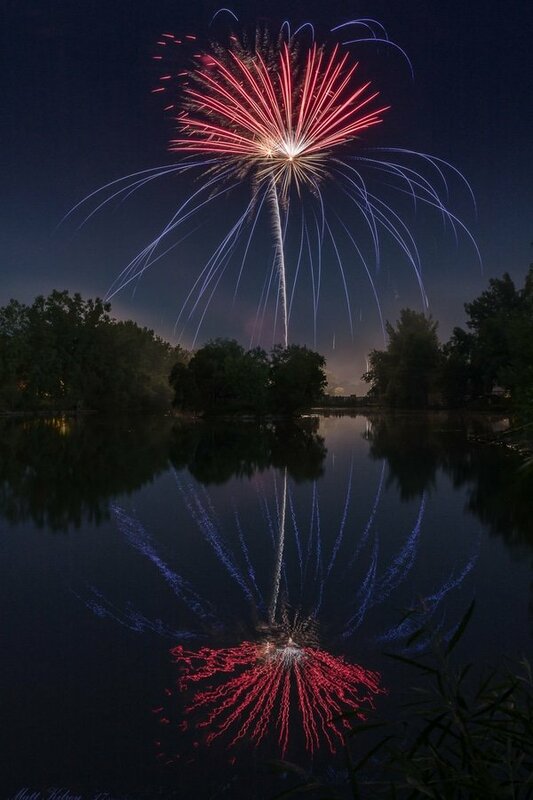 The beauty of the colors reflecting off the water, synchronized to music, while having some amazing scenic views all around is certain to “wow” you and prove to you that this is one of the best places in the US to watch those Fourth of July fireworks. TIP: Views are great anywhere along the Pier shore and it’s free to attend. Shows last anywhere from 10-15 minutes and happen to be synchronized to music as well! St. Louis, Missouri. Not only has St. Louis, Missouri been labeled as the city to host “America’s Biggest Birthday Party”, it’s also the perfect family-friendly city to find some of the best fireworks around. Gather with the others from the Show-Me state and have fun celebrating America’s birthday together. TIP: Arrive early as it’s a crowded venue. Mosquitos in Missouri are hungry! Bring that bug spray! KaBoom Town Fourth of July Firework – Addison, Texas. Photo credit: Town of Addison Texas. Addison, Texas. While a small city by day, Addison, Texas grows in size by over 450,000 just to view their spectacular fireworks show. That is itself is worth seeing! 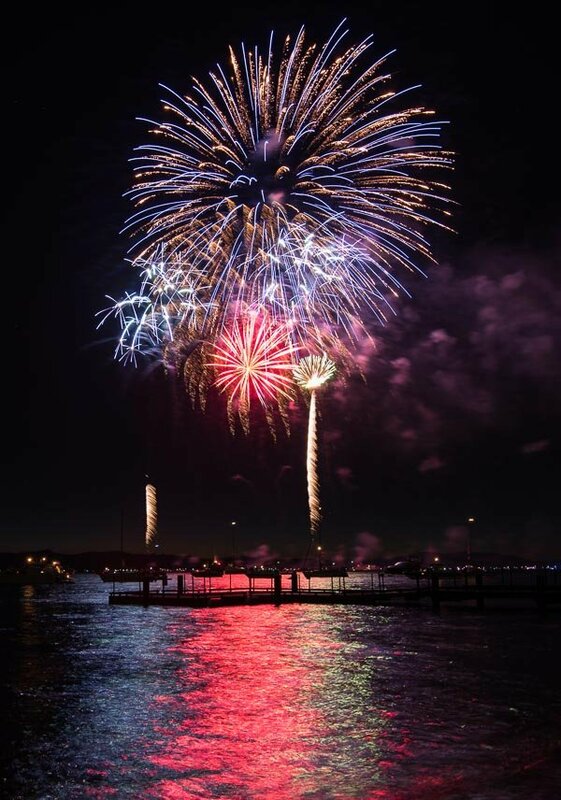 Why not take a trip and be welcomed with that southern hospitality as well and see why “everything is always bigger in Texas”, including their fireworks show! TIP: Bring plenty of fluids to combat that hot July weather and be prepared to watch a fireworks show of 30 minutes or more! Watertown, South Dakota. Possibly one of the biggest reasons that the town of Watertown, South Dakota loves to put on a grand fireworks show is because it’s done by one of the local fireworks companies in town, family owned and operated! It doesn’t get any more family-friendly than that! TIP: Lawn chairs are allowed, but alcohol and coolers are not allowed. Get excited and geared up by watching the pre-show starting prior to the main fireworks display! Lake Tahoe, California/Nevada. Perched on the border between California and Nevada, the country’s largest alpine lake is the perfect place to soak in a magnificent fireworks show. Spend the day swimming and boating on the water before you find the perfect spot to watch the light show. These fireworks illuminate the Sierra Nevada mountains in the backdrop, making it one of the most breathtaking displays you’ll find. TIP: drink plenty of water due to the altitude and remember the hottest of days can turn into cold nights quickly. Bring layers and a lightweight blanket! 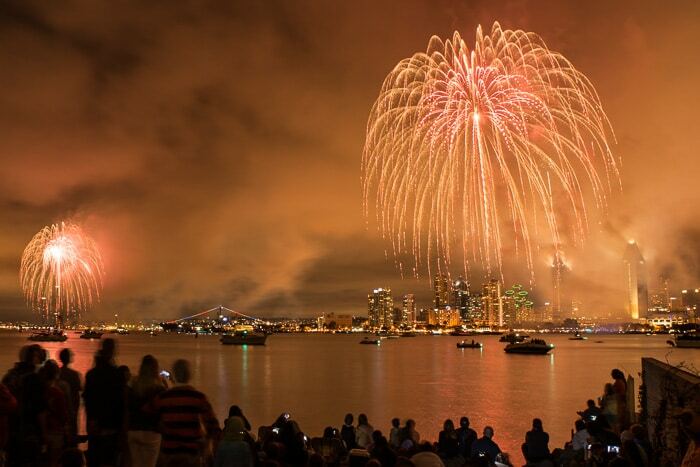 San Diego Fourth of July Fireworks. Photo Credit: Tristan Loper. San Diego, California. Planning a summer getaway to this coastal city around the July 4th is a great idea for those in search of an awe-inspiring fireworks show. This seaside city launches fireworks from barges in the bay and synchronizes the whole show to music for a real treat. Known as the Big Bay Boom, you’ll be blown away by the size and scale of the fireworks you’ll see here. Watch the display from the water or throw down your lawn chair and gaze skyward when the show begins. How to Find ‘Fourth of July Fireworks Near Me’? The fireworks shows listed above are some of the biggest and best that the US has to offer. however, if you are wanting a smaller venue or something closer to home, there are a ton of local fireworks that are stunning and amazing as well! Google is a great place to start to find the fireworks shows closest to you. I found this cool website that lists all the fireworks shows in every state and in all the cities. Select your state, then the city to get all the details. Often local news channels will list all the known fireworks shows happening in an area on their website. Local Tourism Boards, Visitor Bureaus or city websites usually post firework events on their website or social media channels too. Home Fireworks Displays: Not Legal Everywhere! Some states, cities, and counties are NOT fireworks friendly. That means certain locations don’t allow fireworks to be set off at all, while others may allow them but have different regulations. For instance, where I live in Boulder Colorado there is a stand every year that sells them locally however there is a fireworks ban most years so they cannot be set off here (even sparklers). Do your research and understand what is legal or not before attempting to purchase, set off, or bring fireworks with you into another state. 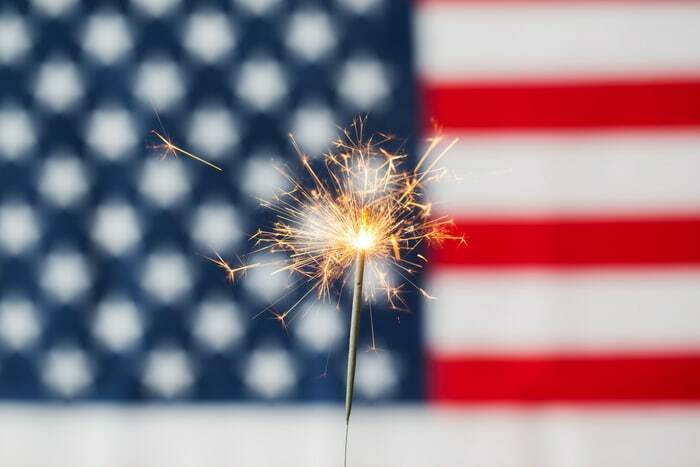 The last thing that you want on your Fourth of July holiday is to find out that you’ve broken a law or ordinance and can incur a hefty fine; even just with sparklers or snakes (love those). Check with your local fire department or police department on current regulations. 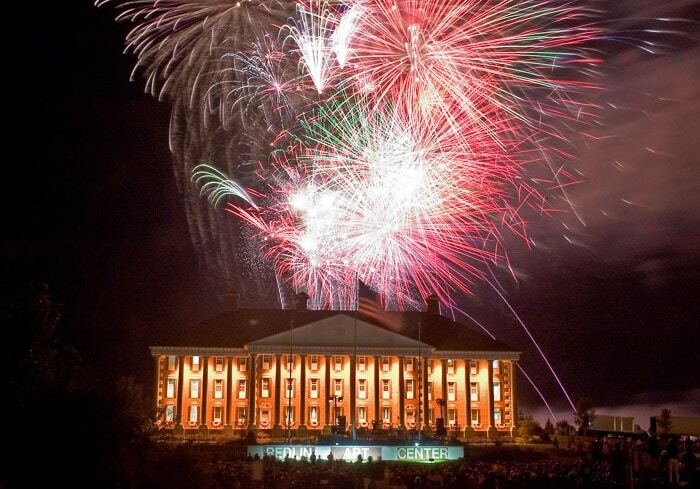 The best part about celebrating the birth of our nation is that there are firework shows to be viewed everywhere! Decide how far you want to travel; whether you mind larger crowds or want a more intimate venue and pack critical items to ensure your comfort. Have you been to any of these locations to watch Fourth of July fireworks? I WANT TO HEAR FROM YOU! Or tell me YOUR favorite place to watch Fourth of July fireworks! 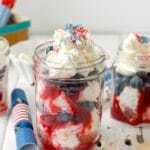 If you liked this Best U.S. Cities for Fourth of July Fireworks travel guide please SUBSCRIBE and FOLLOW ME on FACEBOOK , TWITTER , INSTAGRAM and PINTEREST to see more delicious food, travel and what I’m up to! 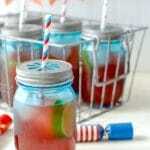 Firecracker Punch: A Fruity Fizzy Punch with a Bang! Such a great idea! I love fireworks! I would love to go to Lake Tahoe for the fireworks show! It sounds like it is beautiful to watch. I would love to watch the fireworks in Boston! That would be amazing – I’ve only ever been to Boston once but I loved it so I can imagine how fun Fourth of July festivities would be. I am loving all of your tips especially the suggestion to bring garbage bags. You can even hand some out to others so that the area stays as beautiful as it was before the event started. I would love to go see any of these fireworks. I have always wanted to see them in New York. I bet they’re so beautiful there too. The beginning of July is my favorite with all of the fireworks shows. I’m so fortunate to live close to nyc. That cookie dessert pizza looks amazing! I really need to recreate it this summer! I love watching a good fireworks show! We actually are lucky to live near a good one at a local race track. Great ideas! It might be nice to celebrate in a big city this year. The New York celebrations always seem impressive. I’d love to visit any of these cities to watch the fire works. I love all the celebrations and usually catch them on tv or the news. I’d love to head to one of these in person! Thanks for sharing these locations! My entire family loves fireworks. I think it would be awesome to plan a huge road trip around fireworks. If I ever make it happen, this will be my resource. I’m so glad it was helpful Stacie! We love fireworks too. Each time I see them I’m amazed and find pyrotechnics fascinating.